It has been a few months since I joined the Foreign Service, time for an update! A-100 is six weeks long, and I had 97 classmates. We had classes in management, State organization, interdepartmental relationships, all the good (sometimes sleepy) stuff you'd expect from a federal agency. The highlight of A-100, therefore, was what is famously known as Flag Day, where we were given our assignments. It was a day fraught with tension and excitement - a flag was projected on a screen, a name was called, and we were given a flag of our assigned country by Ambassador Ken Merten. Happily my name was called towards the beginning so I could enjoy celebrating with the rest of my classmates as they were given their posts. I was assigned one of our top bids - Kingston, Jamaica. 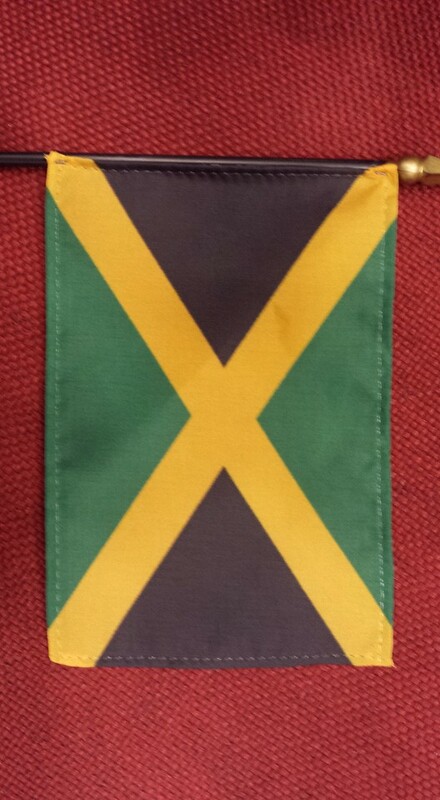 We asked for Jamaica primarily because The Historian was offered a new job in DC right after my own offer came in. After much discussion, we agreed that for my first tour, he would take the new job while I did my first tour. Kingston was therefore very appealing for its proximity to DC and because it is an English-speaking post. This means I will have to have language training after this tour, and that will give Chris nearly three years in his job before he joins me for my next post. After A-100 concluded, I had a few weeks of specialized training and arrived in Jamaica in late July. 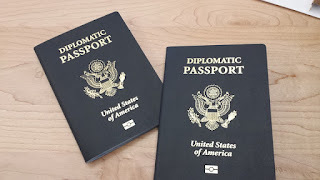 My job here is as a Consular Officer, and I currently interview 100+ applicants/day who are applying for non-immigrant visas to come to the United States. This is usually tourist visas, but could also be business, student, or exchange visitors. I've done around 3500 interviews so far. Jamaica is an interesting post - it is a critical crime threat post, and household goods are very expensive (a new ironing board priced out at $65) This will put me in the first tranche for bidding on my second tour. Jamaica also has a unique relationship with the US - its proximity means that flights are cheap, and everyone has a family member (or several) who live in the US. This means that we have an extraordinarily high number of visa applicants - it is not implausible for a poultry farmer who lives on a few hundred dollars a month would make a trip to the US to see family or to go shopping, something that would be out of reach for an equivalent income in nearly every other country. My housing is nice, and the views are amazing. There is one beach we can get to from Kingston, by hiring a fishing boat to ferry us to an uninhabited island. Otherwise the more famous beach cities are 2.5 hours (Ocho Rios) and 4.5 hours (Montego Bay) drive. I'm looking forward to exploring some of the less touristy beaches. The embassy also organizes various excursions, including to release endangered sea turtles and an excursion to the Appleton rum distillery. Household help is also very affordable, and I have an amazing helper who comes two days a week who cleans, cooks great Jamaican food, and does light shopping. If you are a Facebook friend, you will also know that we had a brush with Hurricane Matthew over the weekend. One of the best things about the State Dept is that it really is a community (there are fewer diplomats than there are military band members in this country). It was amazing to watch how everyone pulled together to either support those who evacuated and to ensure the safety of those of us who stayed. What's this all about then? South Dakota girl who got lost in Los Angeles for a while and then escaped to Seattle. Currently serving in the U.S. Foreign Service in Jamaica. Opinions are my own. Following the Sky Road by http://hihankara.blogspot.com/ is licensed under a Creative Commons Attribution-NonCommercial-NoDerivs 3.0 Unported License.